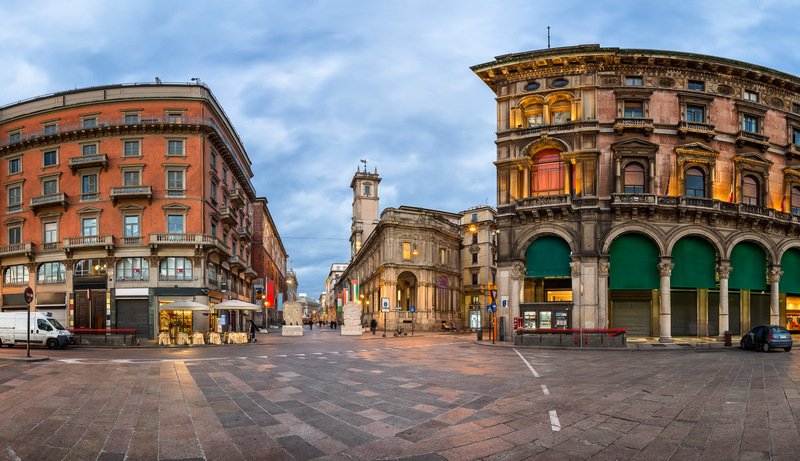 After capturing couple of panoramas just in front of the Duomo Cathedral I went to the other side of the Piazza del Duomo. My first idea was to compose sweeping view of the entire square with the Duomo di Milano as main focal point. But shortly I discarded this idea because of the visual clutter and half-disassembled christmas tree in the very centre of the square. Then I turned around and found the nice view with Via dei Mercanti entering Piazza del Duomo. The morning light was just fine with the sun rising behind my back and rendering beautiful facades in perfect 3D. I quickly adjusted my tripod and captured this wonderful scene. Panorama from 3 vertical images, additional exposures for highlights, focal length 16mm, aperture f/11, shutter speed 2.5 seconds, ISO 100, tripod, pano head. This entry was posted in City and tagged Italy, Milan.